This post summarizes some joint research with Charles Celerier, Caroline Melles, and David Phillips. Define a partial order on as follows: for each , we say whenever we have , , …, . A Boolean function is called monotone (increasing) if whenever we have then we also have . Monotone functions on are in a natural one-to-one correspondence with the collection of admissible sets. The algebraic normal form is . The following result is due to Charles Celerier. The following example is due to Caroline Melles. This function is monotone yet has no vanishing Walsh-Hadamard transform values. To see this, we attach the file afsr.sage available from Celerier (https://github.com/celerier/oslo/), then run the following commands. 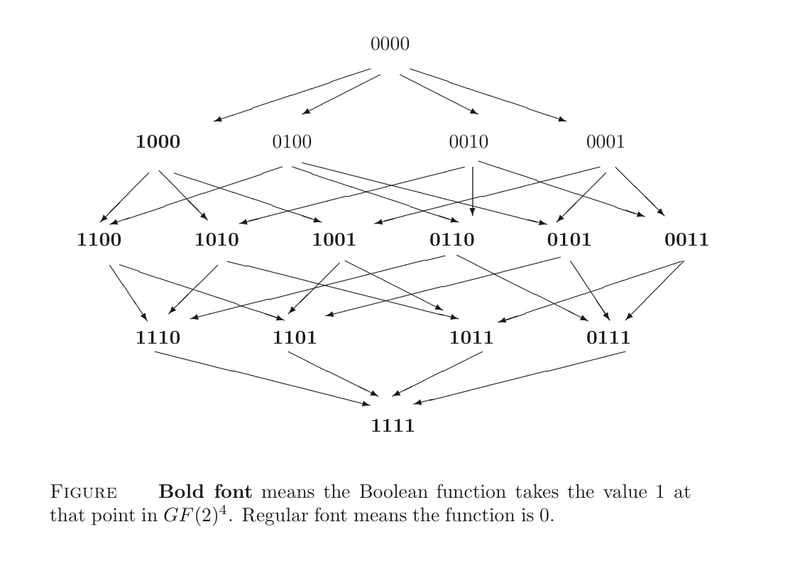 These commands simply construct a Boolean function whose least support are the vectors in L. Next, we compute the Walsh-Hadamard transform of this using both the method built into Sage’s sage.crypto module, and the function in afsr.sage. (Note: the Walsh transform method in the BooleanFunction class in Sage differs by a sign from the standard definition.) This verifies that there are no values of the Walsh-Hadamard transform which are . More details can be found in the paper listed here. I end with two questions (which I think should be answered “no”). Question: Are there any monotone functions of variables having no free variables of degree ? Question: Are there any monotone functions of most than two variables which are bent? This entry was posted in math, sage and tagged Boolean functions, sage. Bookmark the permalink.